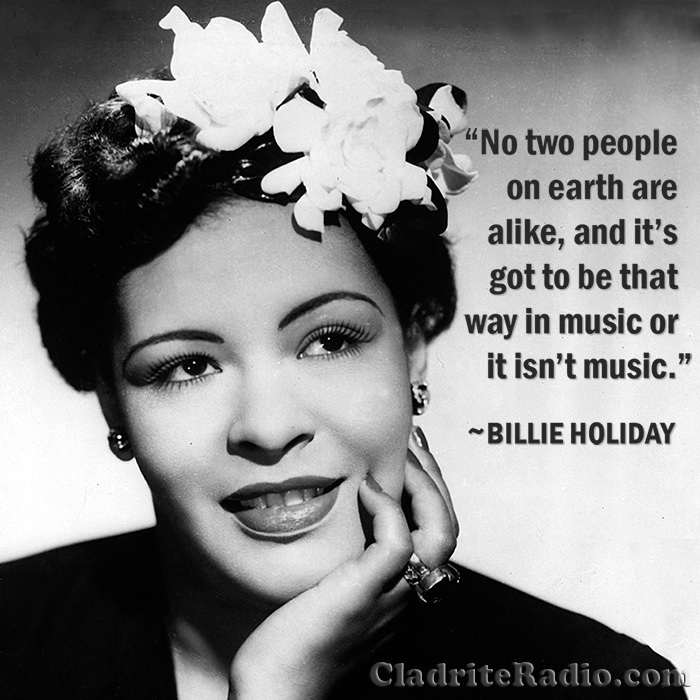 Happy 102nd Birthday, Billie Holiday! Holiday’s childhood was a tough one. Her parents were teenagers and never married. Her mother worked mostly on railroads and so left Holiday with her half-sister, Eva, and Eva’s mother-in-law in Baltimore. By nine, Holiday was sent to a Catholic reform school due to her truancy and other behavioral issues. Eventually, her mother opened a restaurant and Holiday dropped out of school at age 11 to help with its operation. At 12, Holiday was raped by a neighbor and, after a stint in protective custody as a state witness against the perpetrator, she began working as an errand girl for a brothel. At 14, Holiday was reunited with her mother, who had relocated to Harlem. Their landlady was the madam of a brothel and soon, both mother and daughter were working as prostitutes. Thankfully, Holiday, who had by then been exposed to the music of Bessie Smith and Louis Armstrong, also began singing in Harlem nightspots. Her professional name came from actress Billie Dove and jazz musician Clarence Holiday, believed by many to be her long-absent father. Holiday’s close friend and musical collaborator, saxophonist Lester Young, was the person who gave her the nickname with which she would come to be so closely associated, Lady Day. She gave him his nickname, Prez, because of her deep respect for President Franklin Delano Roosevelt. Though Holiday’s singing style was distinctive and memorable, her vocal range was limited, just over one octave. Holiday’s 1941 recording of Gloomy Sunday, though by some to inspire suicides, was banned from airplay on the BBC until 2002. Holiday was a comic book fan as an adult; Captain Marvel was a particular favorite. Holiday, by then a heroin addict, was sent to prison in 1947 on a narcotics conviction. Eleven days after her release in March 1948, she performed before a sold-out house at Carnegie Hall. Holiday once named fellow vocalist Jo Stafford as her favorite musical artist; she admired Stafford, she said, because she was so ladylike. Nightclub performers in New York were required to have cabaret cards, a kind of municipal license to perform. Holiday’s narcotics-related legal troubles prevented her for acquiring a card, so she was unable to perform in NYC clubs for the final 12 years of her life. Holiday’s hardscrabble childhood left her with a lifelong fear of poverty. When she passed away, she had less than a dollar in the bank and had $750 strapped to her leg. Happy birthday, Billie Holiday, wherever you may be! Happy 101st Birthday, Gregory Peck!